LAST UPDATED: November 14, 2018 at 6:00 p.m.
MALIBU (CNS) - The death toll from the massive Woolsey Fire burning through Malibu and surrounding areas appeared Wednesday to have risen to three, with authorities confirming the discovery of a charred body in a burned-out Agoura Hills home. The Los Angeles County Sheriff's Department called the discovery amid the remains of a home in the 32000 block of Lobo Canyon Road an "apparent fire- related death." An official with the county coroner's office said the office was notified about the discovery around 5:45 p.m. Tuesday. Sheriff's officials said deputies went to the home in response to calls from relatives who said they were unable to reach the man, described by neighbors as a retired doctor in his 70s. Deputies initially found no sign of him, but they brought in cadaver dogs, leading to discovery of the remains. A woman who lives in the neighborhood told NBC4 she didn't know the man who lived in the home, but she said he "had been ill, from what I understand." The 97,620-acre Woolsey Fire, which began last Thursday in Ventura County and burned its way into Los Angeles County, had previously claimed two other lives. Those two victims were found Friday in a burned-out vehicle on a long driveway in the 33000 block of Mulholland Highway. Authorities said they suspect the driver became disoriented amid the flames. Meanwhile, fire crews continued making progress surrounding the flames, with containment listed Wednesday morning at 47 percent. Full containment was expected by Sunday. The fire has destroyed 483 structures and damaged 86 others, although authorities have said they expect those figures to increase when the fire and smoke clears. An estimated 57,000 structures are still considered to be threatened by the flames, which continue to be fanned by winds expected to gust as high as 40 mph Wednesday. The fire has forced the evacuation of more than 265,000 people in Los Angeles and Ventura counties, although evacuation orders were slowly being lifted. On Wednesday morning, all remaining evacuation orders in the city of Calabasas were lifted. Residents were allowed to return to select areas on Tuesday. Officials also lifted evacuations in a swath of Malibu, the entirety of which had been ordered evacuated last week. Evacuations were lifted in an area from Pacific Coast Highway between Carbon Canyon Road on the east to Webb Way on the west, from the ocean to the northern city limit. Residents of the Serra Retreat and Sweetwater Mesa neighborhoods were also allowed to return. The Malibu Colony neighborhood remained closed, along with the Civic Center area. Evacuations were also lifted near Agoura Hills on Kanan Road from Cornell Road to Malibu View Court; the area southeast of Kanan Road, including the Saratoga Hills neighborhood; and Cornell Road from Kanan Road, north of Wagon Road. Despite the progress being made in certain areas, fire officials said there are still very active flames burning. Cal Fire Assistant Chief Chris Anthony noted there was significant fire activity overnight on the fire's western flank in Ventura County, particularly in the Sycamore Canyon and Point Mugu area. 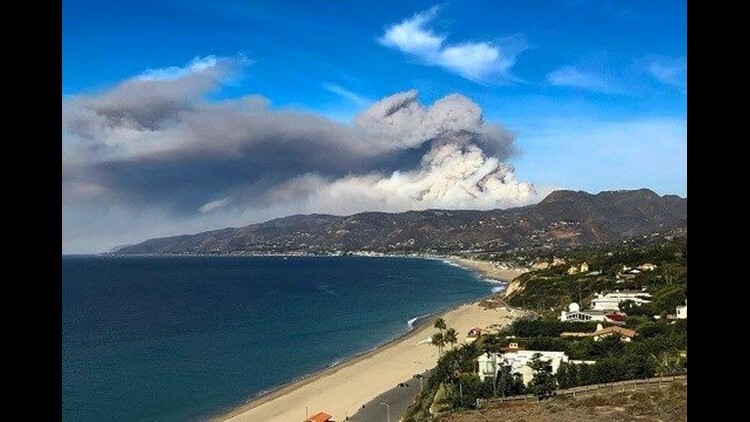 He also said there was still a fire threat in the Malibu Canyon area on the eastern flank, and hand crews planned to work Wednesday to establish a containment line in that area from below the Ventura (101) Freeway south to Pepperdine University. Los Angeles County Fire Chief Daryl Osby said Tuesday there was fire burning deep in inaccessible areas of Malibu Canyon, raising fears of wind- blown embers that could spread the flames into unburned areas within the fire line. Anthony said crews have established good containment lines around the fire north of the 101 Freeway, and he said an anticipated shift in winds from an off-shore to an on-shore flow later Wednesday will hopeful aid crews in surrounding the fire on the northwest flank in Ventura County. -- Hidden Hills was fully reopened, including all residences within the city limits. The area includes the area west of Valley Circle Boulevard, east of Crummer Canyon Road and north of the Ventura (101) Freeway to the northern city limits. -- In Westlake Village, the area was opened from the city limit on the west, from the intersection of Westlake Boulevard and Sycamore Canyon Drive north to the boundaries of Ventura County and city of Agoura Hills. -- Agoura Hills reopened its impacted areas from Chesebro Road on the eastern border, and Agoura Road from Chesebro Road to the west, along with neighborhoods south of Agoura Road, east of Cornell Road, west of Las Virgenes Road and north of Mulholland Highway, though power may still be out. -- the eastern section of Malibu, including neighborhoods west of Coastline Drive; east of Carbon Mesa Road and from the ocean to the city limits. A full closure remains in effect on Topanga Canyon Boulevard. Long stretches of Pacific Coast Highway also remain closed, with Anthony noting a large number of fire vehicles and utility crews are using the road to access the fire area. Residents can determine if their property is in an area that has been re-populated by visiting: http://ow.ly/9R9U30mBMHN. At a community meeting at Santa Monica High School Tuesday night, authorities again warned people to stay clear of the evacuation zones, despite growing unrest among residents anxious to return and learn the fate of their homes. The sheriff's department has repeatedly tried to reassure residents that their homes would be safe from looters, with more than 600 deputies on 12- hour rotational shifts. As of Wednesday morning, there were 3,685 firefighters assigned to the blaze, aided by 22 water-dropping helicopters and 16 bulldozers. Crews from other areas, including Orange County and Arizona, also sent firefighters and equipment to aid the battle. Three firefighters have been injured battling the Woolsey Fire. Pepperdine University's Malibu and Calabasas campuses will remain closed through Thanksgiving. All Malibu schools in the Santa Monica Malibu Unified School District will remain closed until at least Thursday. Los Angeles Unified School District officials said Topanga Elementary Charter School will be closed again Wednesday, and will likely remain closed "until roadways around the school are reopened and the school is no longer within an evacuation zone." The campus is normally used as a drop-off/pick-up site for students from Paul Revere Charter Middle School, but that site has been temporarily moved to Hughes Adult Learning Center, 5607 Capistrano Ave., Woodland Hills.